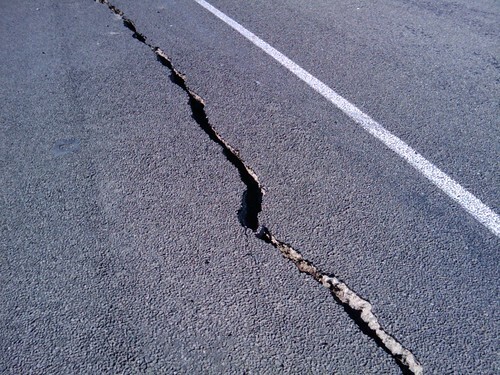 A big earthquake hit Christchurch yesterday in the dark early hours of the morning. Nobody died, which is (as everyone is saying) amazing. There are so many brick buildings in Christchurch, and from the photos I've been looking at, lots of them are now rubble. Growing up in Wellington, earthquakes were a spooky and threatening reality. We did earthquake drills at school, jumping under our desks and giggling. The real thing was more scary. "It's earthquake weather," Mum would say, on any particularly still and warm day. She was often right - a strange silence before the earth began to jolt and shudder. I remember being at school the day after a big one, and seeing a giant crack in the concrete wall where the building had shifted several feet off its foundations. Wellington has always been the focus of earthquake attention. I never heard anyone mention the possibility of Christchurch. We get so used to the idea of what and where is safe, I suppose. I can't imagine Auckland being rocked by an earthquake, but you never know. Those precarious childhood memories never completely disappear, even if they seem illogical and unlikely.